Williams said his office is trying to stay out of the fights over the regulations themselves and simply wants to come up with a set of rules to fairly govern how properties that operate more like hotels than regular apartments should be assessed. “We’re not trying to scare people away,” Williams said. Short-term rentals are currently considered residential properties, regardless of whether they ever house their owners or any other long-term tenants. For residential properties, taxes are calculated by taking 10 percent of the fair market value of the building and land to get a figure known as the “assessed value.” The assessed value is then multiplied by the tax rate to determine the total amount due to local governments. The assessed value of commercial properties, however, is calculated by taking 15 percent of the building’s value and 10 percent of the land’s value. That increases the assessed value of the building by 50 percent compared to a residential building. Commercial properties also cannot qualify for the homestead exemption, which for most local taxes knocks $7,500 off the assessed value of an owner-occupied property, meaning that a house worth $200,000 is taxed as if it is worth $125,000. Taken together, those changes could increase the taxes on a single property by thousands of dollars, potentially enough to change the calculus for owners deciding whether they can make more money on short-term or long-term rentals. Williams said his office hasn’t yet tried to figure out how much additional money would go to local governments as a result of the proposed changes. There are two issues Williams’ office is trying to work through as it considers the rules. First is how to handle situations where a portion of a property is used as a short-term rental but the rest is used by long-term occupants. The basic plan is to treat those the same way the Assessor’s Office handles other properties that have a mix of residential and commercial uses: Determine how much of the property is being used each way and divide the tax bill proportionally. That’s easy in some cases. A double that has a short-term rental on one side while the owner lives in the other half would be divided 50-50, similarly to how mixed-use properties are treated now. But it gets trickier when dealing with short-term rentals that may occupy only a portion – say a couple of rooms – of an otherwise residential unit. The current plan is to work with the city to require owners to submit floor plans showing which parts of the unit are being used for short-term rentals and which are not, Williams said. There will also have to be rules on how to handle common areas and kitchens that are used by both long-term and short-term occupants, he said. The office plans to handle multiunit buildings, which are now considered entirely residential, in a similar manner, he said. The other question facing Williams’ office is how to treat whole homes that by law can be rented out for no more than 90 days each year and might be vacant the rest of the year. The office is trying to decide whether those would be considered entirely commercial properties or if they would have that designation only during the three months when they can be rented out short-term. Then there’s the overarching problem of all short-term rental regulation: tracking down all the properties that are in fact being rented out to tourists. Williams said his office will be relying on the city’s licensing system to determine which properties are being rented, though it remains unclear how many hosts are not complying with the law and getting city licenses. The tax proposals Williams is considering are separate from the city’s ongoing evaluation of its rental regulations. This spring, the City Council called on the City Planning Commission to study the issue and make recommendations; a report is expected this fall. At the same time, the council put a halt to the issuance of the “temporary” licenses that allow whole-home rentals in residential neighborhoods for 90 days a year. Those rentals have been in the crosshairs of short-term rental opponents who argue that they displace residents, raise the price of housing for locals and disrupt the fabric of neighborhoods. In the wake of the council’s action, which barred the city from granting new 90-day rental licenses or renewing existing ones, the total number of licensed short-term rentals in the city has fallen by more than 20 percent, from a high of nearly 4,850 to about 3,830. Most of the decline came from “temporary” licenses that have expired, though no one knows how many of those owners continue to list and rent their properties illegally. 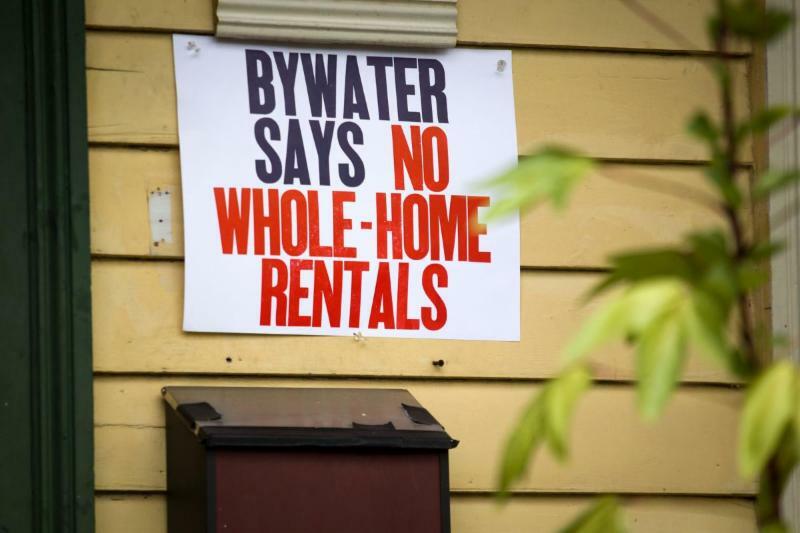 Eric Bay, who heads a group of short-term rental owners called the Alliance for Neighborhood Prosperity, said the new assessment rules would put his members at a disadvantage compared with those renting out their homes to long-term tenants. “As an industry and personally, we would not be opposed to having a special tax assessment on our rentals, but we would strongly stand up and say it needs to be applied to every single rental unit in the city,” he said.